Thank you for considering eco-friendly shipping supplies! 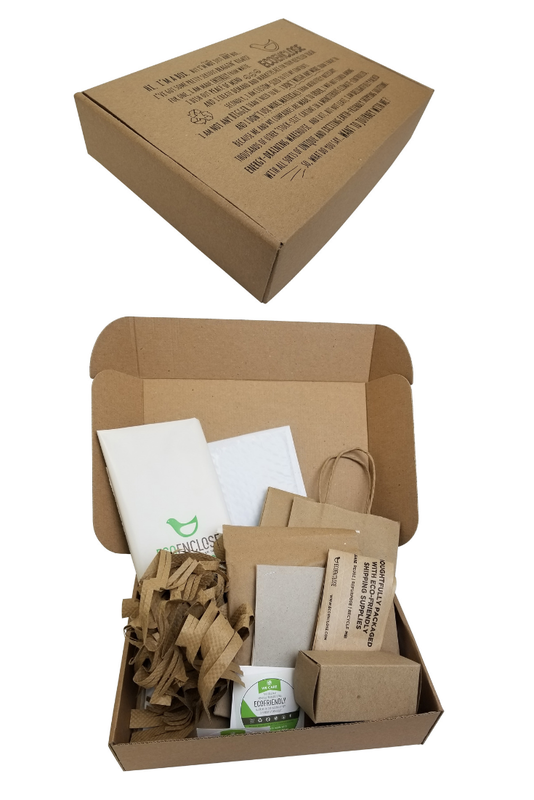 If you've perused our site and want to be able to see some of our earth friendly packaging for yourself, you've come to the right place! We encourage you to order free samples to test our products and find the exact right packaging sizes for your business. Please note that while the packaging samples are free, shipping them is not. You'll see shipping options and rates for these samples in your Cart page or at Checkout. Samples are limited to just one of each specific product and size. If orders are placed for multiple samples of the exact item, we'll ship you one item. If for some reason you do need 2-3 of the same item, please contact us at support@ecoenclose.com so we can accommodate your needs. Additionally, we ask that you order no more than 5 different custom corrugated shipping box samples and 15 sample items total. If you're trying to figure out the right shipping solutions for your business and aren't sure where to start, consider ordering either our Mailer Sample Pack or our Full Product Sample Kit. Our Mailer Sample Pack showcases the different recycled paper and poly mailers we offer. This Sample Pack can help companies who already know they will ship using mailers (versus boxes) decide which one is best for their products. Our Full Product Sample Kit can help companies who aren’t sure where to begin! It features an example of almost every product we offer, so you can start to develop your sustainable packaging strategy. 100% Recycled Poly Mailer - 10 x 13"
100% Recycled Poly Mailer - 14 x 19"
88% Recycled Poly Mailer - 7.5 x 10"
32% Recycled Bubble Mailer - 4 x 6.75"
100% Recycled Padded Mailer - 6 x 9"
100% Recycled Tuck Boxes - 2 x 2 x 4"
Looking for a sampling of all the unique eco-solutions we offer? We've bundled all of our favorites into one delightful and convenient SAMPLE KIT.